Happy Saturday babes! Hope you’re all having a fun holiday weekend with friends & family. Sharing a few basic (but not) pieces today, and a few more of my picks (all 50% off with code: YESPLEASE) for spring. It’s no secret I love a good #allblackeverything outfit no matter the time of year. It always works, looks good, and is slimming (yes please!). The flutter sleeves on this tee are the perfect ‘extra’ for a basic tee. I love the oversized fit and the raised dots on the sleeves as well. I’m wearing a size small, definitely could have done the xs, it does run a little big. Ann Taylor has so many pretty tops right now, I just added this one to my cart (50% off today!). These jeans are so comfortable and you know I love the step hem! They’re on major sale today, I’m wearing a size 0 (normally a 26). 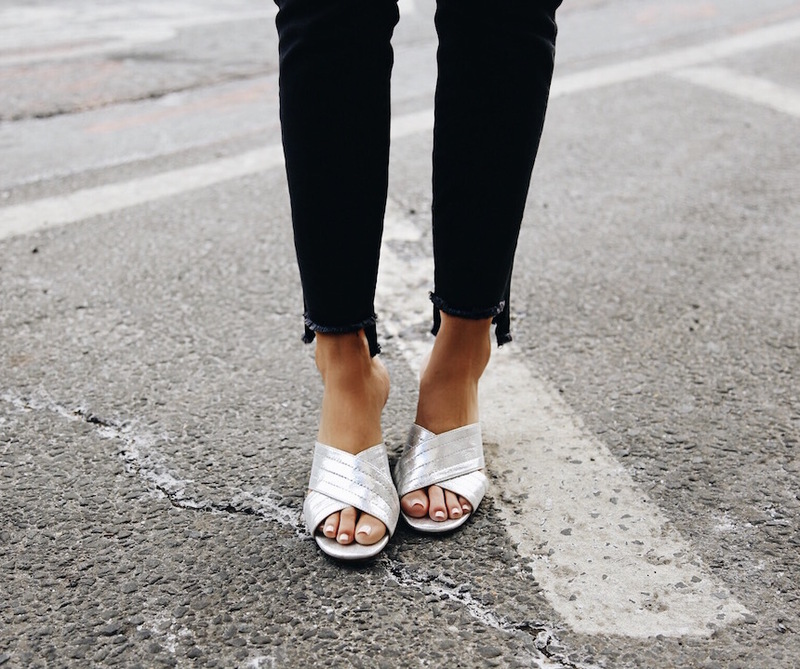 These slides (true to size) are going to be on repeat all spring & summer. I’ve been wanting a metallic pair for over a year and I looooove these! I wore them to the city for brunch and an afternoon in Soho and they were so comfortable all day. They also come in black which I love. I just added this pair and this pair to my cart since they’re 50% off!